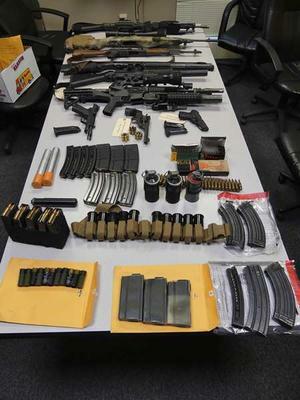 A Frisco couple was arrested at a Boston-area hotel after police found a stockpile of weapons in their room and vehicle, police said. Adrianne D. Jennings, 40, and Francho S. Bradley, 59, were taken into custody at a Marriott Residence Inn in Tewksbury, Massachusetts late Saturday afternoon. Bradley contacted police to report that someone was breaking into their hotel room. When officers arrived, they found numerous large capacity firearms and ammunition. Police then searched the couple’s car, where they found more weapons and ammunition. Bradley and Jennings were taken into custody and face multiple charges, including: 8 counts of possession of a large capacity firearm, 19 counts of possession of a large capacity feeding device, 3 counts of possession of a silencer, 8 counts of improper storage of a large capacity firearm, improper storage of a firearm, possession of a firearm without a license, possession of ammunition without a license and possession of a bump stock. Police are investigating to determine why the couple was staying in Massachusetts and why they were in possession of so many weapons.